Introducing HomeRun Home Batting Cage, the most affordable and revolutionary batting cage ever developed for improving your hitting at home. The Trend Sports® HomeRun Home Batting Cage delivers innovation and quality in an affordable batting cage right to your own backyard. Built for ease-of-use and durability the HomeRun sets-up in minutes. The unique fiberglass pole design, strong 3/4” poly netting, and steel ground stakes provide unusual strength and support along with the flexibility to withstand the elements. 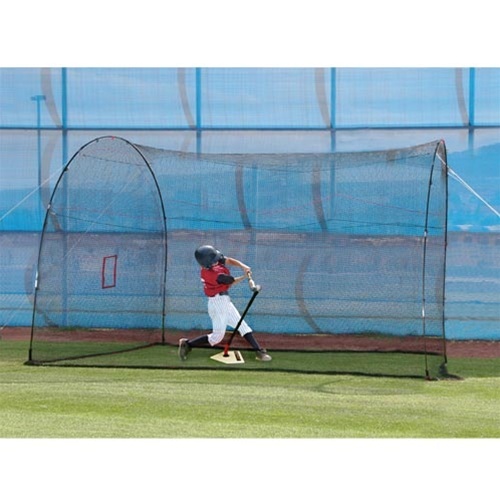 Measuring 12 feet long, 12 feet wide, and 10 feet high the HomeRun is the smartest batting cage for home use. Limited instructions for net set up. I had to install additional rope to secure net. Needed two (2) 8 foot set ladders to install net. Takes three people to put net on weak structure. 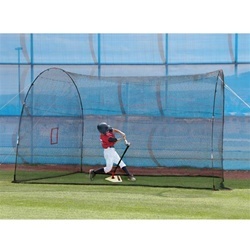 I would not buy another pitching net. This thing is a pain in the @ss to set up. After 2 hours and 4 people we still do not have the net looking like the picture. Also what's with the black tape to make the poles stick together? Ever heard of shock corded poles like tents? After a lot of work and several beers we have it so it is functional but I'm not sure I would buy it again.. The net needs better markings and the instructions are bad. difficult to put up,and secure. after many adjustments it in place used more guide rops to stabilize.does serve its purpose.